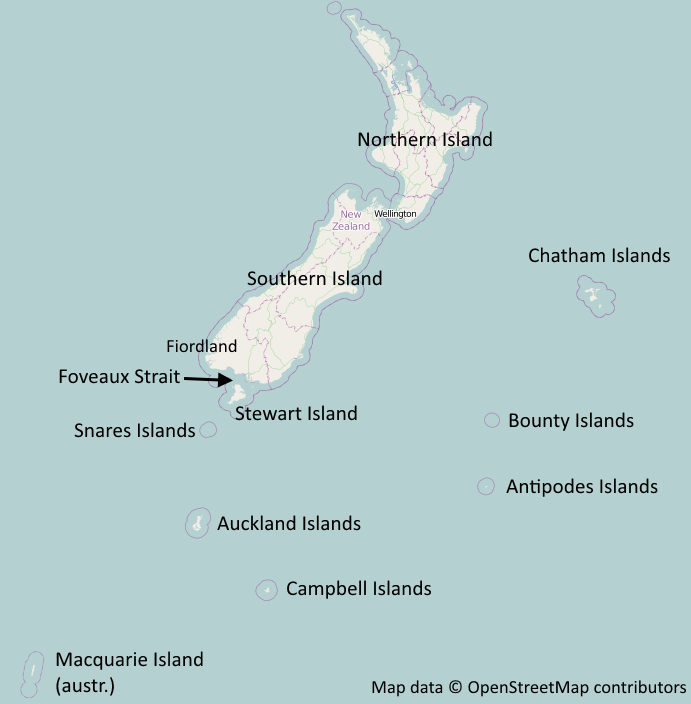 In and around New Zealand six penguin species are distributed: Yellow-eyed, Fiordland, Little Blue, Southern Rockhopper, Erect-crested and Snares Penguin. They predominantly breed on the southern island of New Zealand and on the surrounding islands in the south of New Zealand. New Zealand lies in a temperate climate zone. Due to the oceanic climate the temperatures on land are determined by the water temperature. Summers are warm but not hot and winters are cool but not very cold. The ocean acts as a temperature buffer: water has a high heat capacity and that is why the ocean is still warm in winter because it was warmed up in summer. So, in winter the land is warmed up by the ocean. In summer, the ocean is still cold because it was cooled down during winter and that is why there are not really high temperatures measurable on land. Especially the climate on the southern island of New Zealand and the subantarctic islands surrounding New Zealand is influenced by the Antarctic climate. On Campbell Island, the annual mean temperature is 6,8°C. It is rarely warmer than 10°C throughout the whole year. The New Zealand breeding area is characterized by many different geological conditions: from rocky to flat, with or without vegetation. On Campbell, Antipoden, Bounty and Auckland Islands the ground has volcanic origin, so it is very rocky and uneven. That is why Erect-crested and Southern Rockhopper Penguins prefer Tussock Grass for their clutch because it is soft and prevents their eggs from damage. Nevertheless, some Erect-crested Penguins lay their eggs on the rocky ground or build nests out of little stones. The ground on the Snares Islands is also very rocky. Snares Penguins nest in forests or Tussock Grass. They dig small hollows in the ground and lay little stones, grass or mud in it. Little Blue Penguins breed along the coastline of the northern and southern island of New Zealand and on the Chatham Islands. They nest in hollows in sandy ground, in crevices or in gardens of the inhabitants. The geology of the breeding area of Fiordland Penguins is also very diverse. Some populations breed in rain forest, other populations at steep and rocky coasts. Nests are built under twigs and roots or in crevices to protect their clutch and chicks. Yellow-eyed Penguins dig little hollows in the ground and put in some soft material like leafs or grass. This species prefers opaque vegetation for breeding and they dislike neighbors. The Yellow-eyed Penguin is the only penguin species that does not breed in large colonies. Rarely, they also nest at steep coasts. Penguins are endangered especially in the habitats that overlap with human settlements. They fall victim to pets like cats and dogs or wild animals like foxes that were introduced by humans. Some penguins die due to accidents with cars. Above all, this is true for Little Blue Penguins because they often live in the near of cities. These problems are not existing on islands like Antipoden or Bounty Islands because these are uninhabited. Nevertheless, the populations of Erect-crested and Southern Rockhopper Penguins are declining. But there are still no explanations for this problem. It is supposed that the fish which is the main diet of these penguin species is migrating away from the coast due to the effects of global warming. Another reason could be that penguins compete with fishermen for their food or penguins end as bycatch in their nets. It is scientifically proven that Yellow-eyed Penguins feel disturbed by humans. In presence of humans (e.g. researchers and tourists) they show a stronger heart rate and the breeding success is reduced. A further problem is that their habitat is more and more destroyed so that the area of forests and vegetation is reduced. That is why Yellow-eyed Penguins cannot find suitable nesting places anymore and the breeding success is decreased consequently. Besides, these penguins are more vulnerable to predators. Due to all the threats mentioned above Yellow-eyed Penguins are listed as "endangered" by the IUCN. The population size of a species is also a characteristic for the classification of its conservation status. That is why Snares Penguins are classified as "vulnerable" by the IUCN because of their small population size and their small distribution area. This species is endemic to the Snares Islands in the southern Pacific. The population of Snares Penguins could be decimated very fastly by severe environmental disasters or accidents of oil-tankers. Furthermore, Snares and Fiordland Penguins are threatened by El Nino events or suddenly occurring earthquakes. Fiordland and Southern Rockhopper Penguins are also classified as "vulnerable". The Erect-crested Penguin is even declared as "endangered" because of its small distribution area and population reduction in the past few years. Only the Little Blue Penguin is listed as not threatened although the population trend is declining. This article shows that we human beings represent a major threat to penguins: environmental pollution, introduced animals, habitat destruction, fishing and many other activities can cause great harm, not only for penguins but also for other animal and plant species.